You're more powerful than you think. And this scares me. Eric Liu combats this fear right off the bat. His definition, "power is the capacity to ensure that others do as you would want them to do," sounds self-centered and manipulative. But he goes on to explain that power is a tool, not inherently good or bad. One of the most interesting aspects of this book is that it is not encamped in either the left or the right. He uses examples from all sides of the political arena. 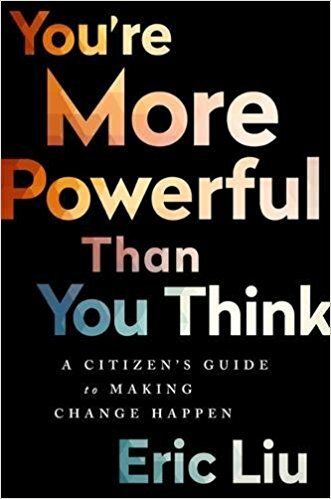 This book has many intriguing examples of citizens wielding power from the campaign for $15 and a union to the Frisco Five to Milton Friedman's proposal of a basic universal income. Though I hadn't heard of many of these examples before, they didn't have the same impact that the examples of This is an Uprising did because it didn't go into as much detailed analysis. Liu has three basic strategies for implementing power: power concentrates so change the game; power justifies itself so change the story; power is infinite so change the equation. This last one was the most mind-changing concept to me. He claims that power is not a zero-sum game, but rather anyone can create more power out of thin air by organizing. A similar game changer was present in Liu's description of his Civic Collaboratory where he tried to get people from organizations of many different aims together to collaborate on a unified project. The first day, he tried to get them to be altruistic. Many realized that working on a common project would detract from the various goals they had for their own organizations. So at the second meeting, they formed a Rotating Credit Club, where a handful of members would get to present a challenge they are trying to solve and get others to make suggestions or critique. This method enabled people to invest in other projects so that when their time came, members would invest in their own project. This particularly interested me because it seems like activists often get cordoned off into their little segments of difference-making without knowing or having the energy to care about what others are doing. This seemed like a workable solution to this problem. "Ethics without power is philosophy. Power without ethics is sociopathy. The effective citizen practices both ethics and power." Perhaps Liu can convince us that wielding power is not an inherently evil practice and something that is necessary if we are going to change the world for the better.